Both brothers are known for their tireless dedication, working day and night for the sake of Allah (swt) and for the causes of the Muslims. We ask Allah (swt) to reward the brothers for their ongoing struggle and sacrifice. They are pictured below during a snap protest late last year against the Russian and Syrian regime bombardment of Aleppo. The protest was called on incredibly short notice but thousands lined the streets in Istanbul. These brothers led the protest that night but are now in custody. 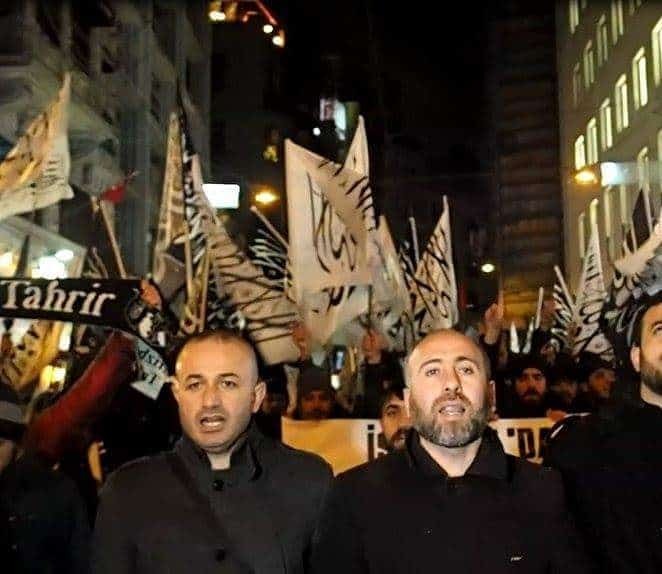 Pictured: Brothers Mahmut Kar and Osman Yıldız from the media office of HT Turkey. This news comes hot on the heels of last weekend’s incident in Palestine, where Palestinian security forces led a charge on a rally held by Hizb ut-Tahrir in the occupied West Bank on Saturday. The event was held as part of a campaign against the PA’s incessant corruption and dealings with Israel. Several members of the crowd were detained after firing tear gas and allegedly assaulting protesters. May Allah free our brothers and keep all sincere Muslims steadfast in the face of the widespread oppression.